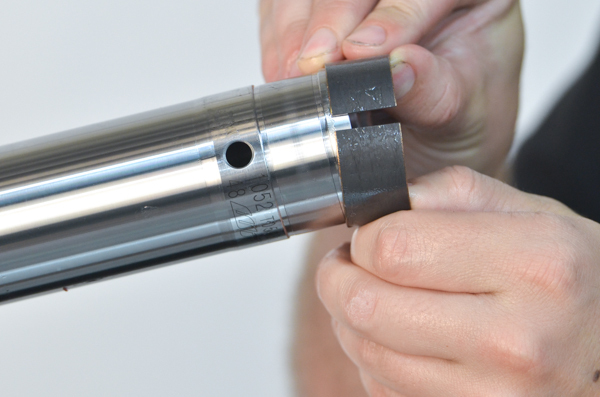 NOTE - GOLD VALVES REQUIRE THAT THESE FORKS BE CONVERTED TO AN OPEN-CHAMBER DESIGN AS OUTLINED IN THE STEP-BY-STEP GUIDE "FORK GOLD VALVE INSTALLATION AND OPEN CHAMBER CONVERSION". 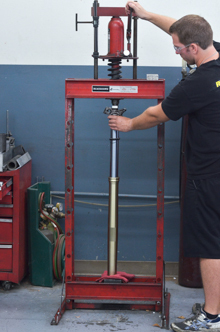 THIS INSTRUCTION OUTLINES THE PROCEDURE FOR A STANDARD REBUILD AS DESIGNED BY WP - IT IS NOT USED FOR A GOLD VALVE INSTALLATION. 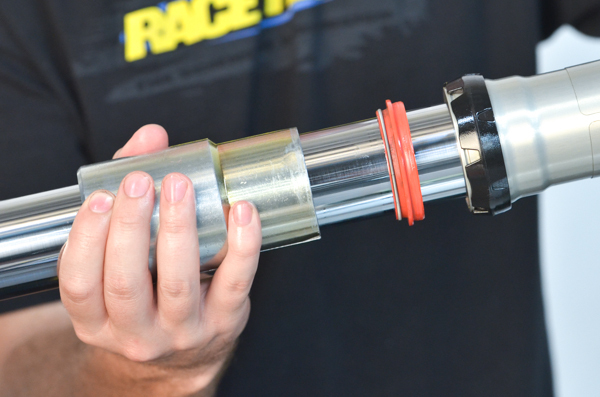 WP 4CS (Four Chamber) forks have been used in KTM European models since 2013. They were in limited U.S. models in 2014 and are on most 2015 KTM full sized dirt bikes. These forks require a special procedure on fork reassembly. The rest is very similar to most modern forks. 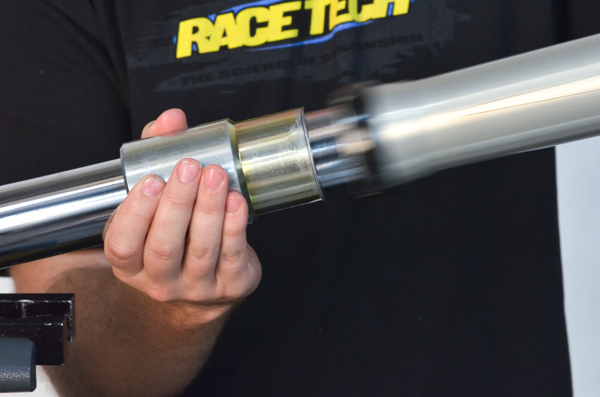 Special thanks to Master Suspension Technician Alan "AJ" Peck (yeah, that's his arm). Note: Click on the images to enlarge. D1- Back both the Rebound and Compression adjusters out all the way. These are on the fork caps. Compression is on the left leg and rebound is on the right. This step is really for reassembly so the needles are not damaged in the process. D2- Loosen the fork cap with a pin spanner (shown). 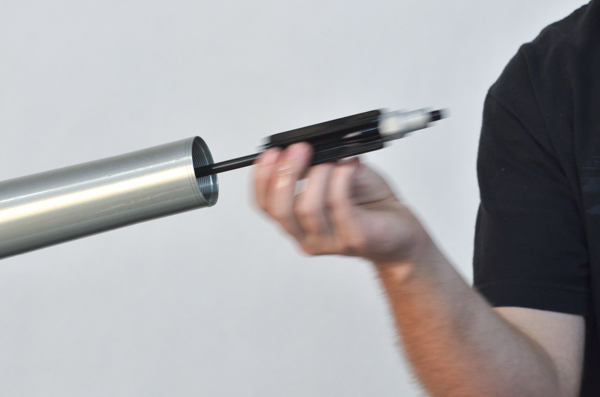 This is a really cool Fork Cap/Comp Assembly Tool (TFCW PS3648). 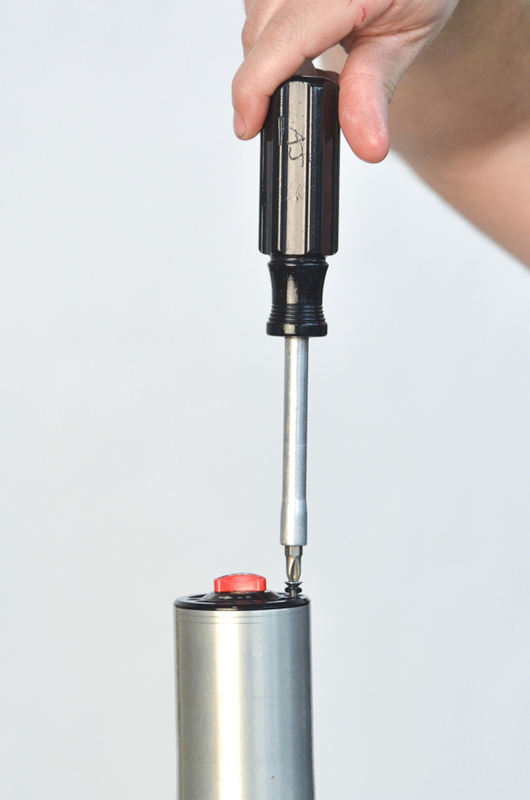 D3- Use the pin spanner or fork cap wrench and a 19mm wrench to remove the cap from the damping rod. D5- Remove the spring from the fork tube. D6- Pour out the oil and dispose of properly. D7- Clamp the fork bottom in a vise. 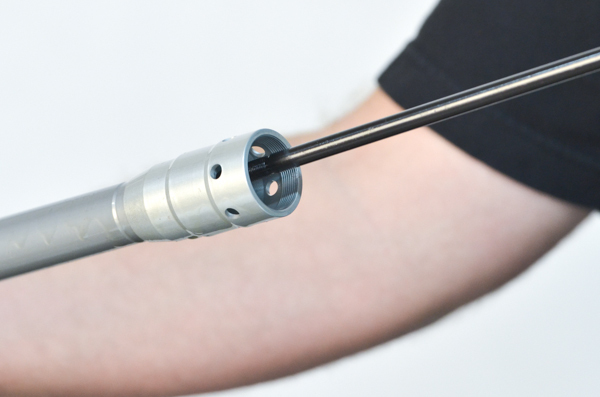 Loosen the compression valve assembly using a 22mm Allen. (Pictured is a modified TFHD 1724). 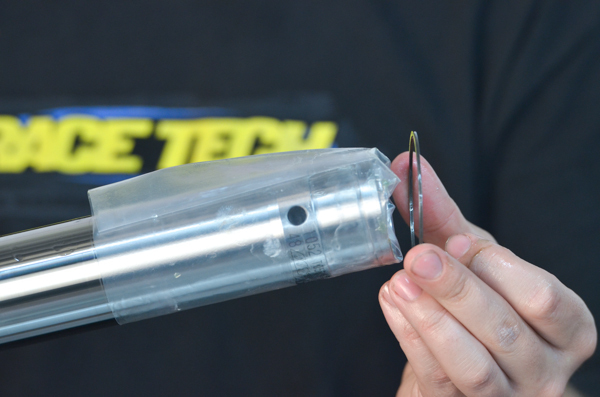 We will have a really cool Fork Cap/Comp Assembly Tool available about mid-October. 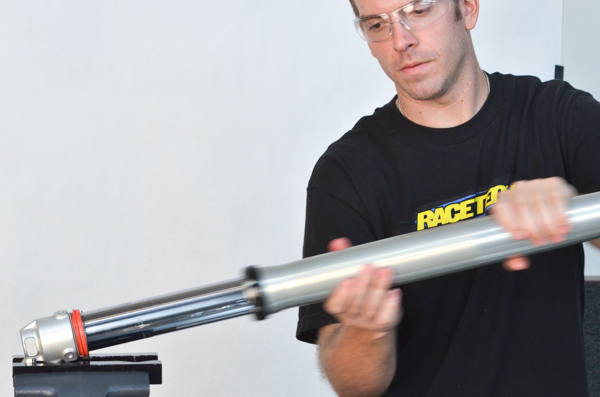 DO NOT USE AN IMPACT WRENCH! LOOSEN BY HAND. 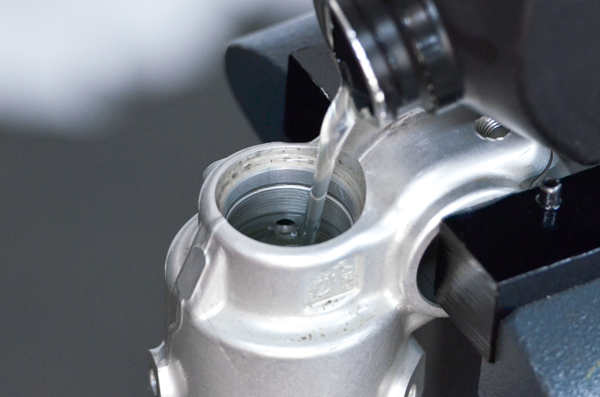 D8- Remove the compression valve assembly from the bottom of the fork..
D9- Pour out the oil and dispose of properly. D11- from the fork tubes. 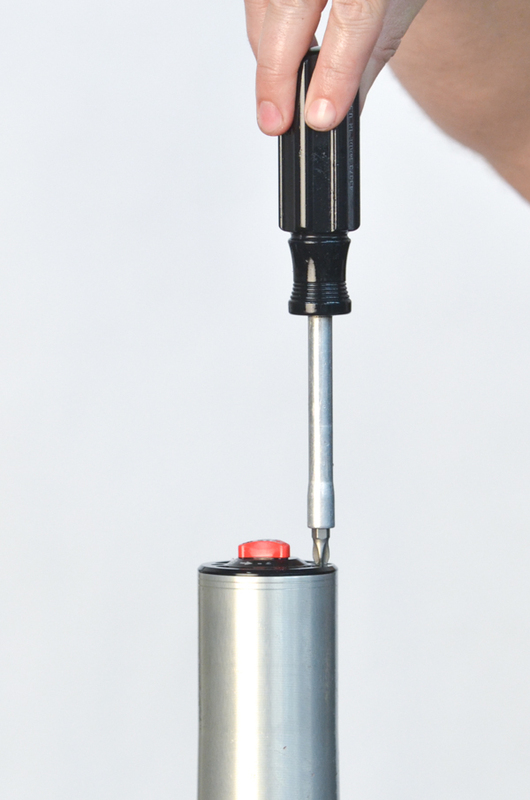 D12- Gently remove the dust seal with a thin flat head screwdriver. 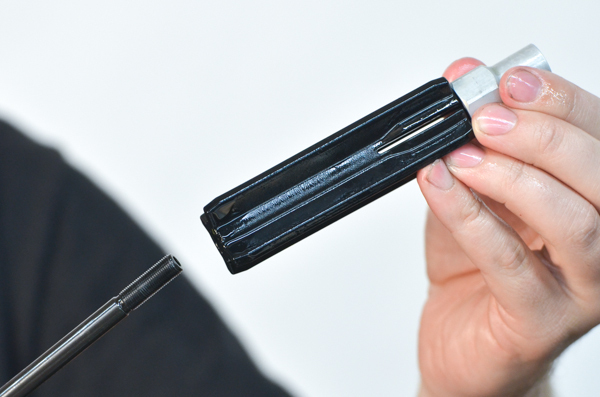 D13- Remove the seal retainer clip with a clip tool (TSCP 01). D14- Slide hammer the fork seal and bushings out forcefully. 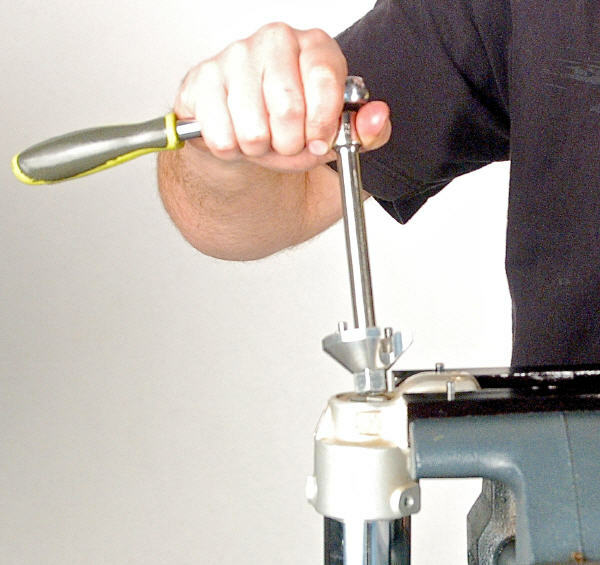 D15- Tip: You may need to heat the seal/bushing area if the tubes don't come apart easily during slide hammering. Try slide hammering after heating the specified area. Use gloves. 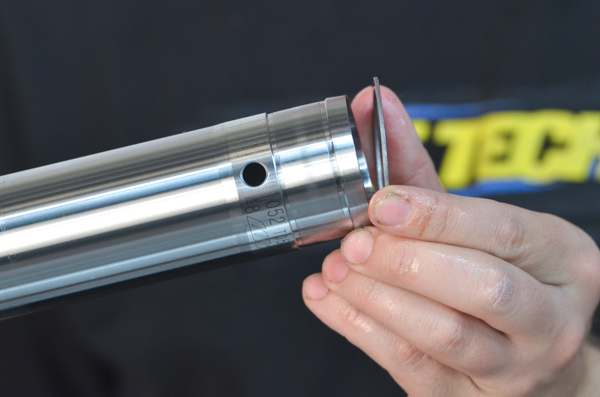 D16- Some forks may suffer damage to the Teflon bushings during disassembly (as shown). Its good to have replacement bushings on hand, just in case. 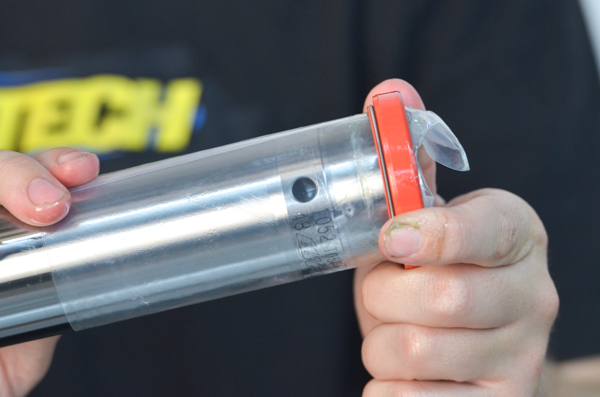 D17- Tip - Another way to remove the seal with a minimal chance of damage to the bushing is to completely fill the fork with used oil, invert it, remove the wiper and clip, and put it into hydraulic press to force the seal out. This seems like it could be a big mess but if the fork is completely full and there is no compressible air space, the seal pushes out and a small amount dribbles over the edge. 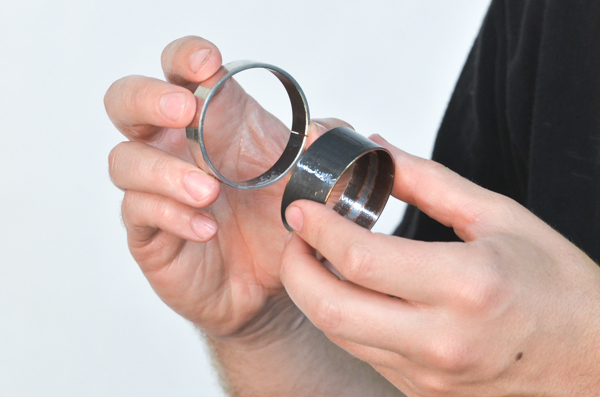 Once the seal is out it is usually much easier to get the bushing out. 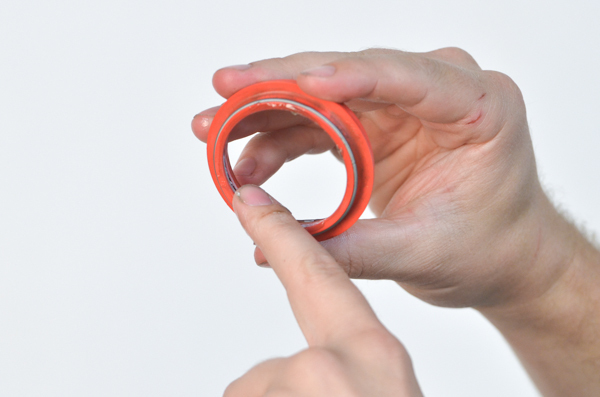 D18- Remove the inner fork bushing by opening up the bushing using your fingernails inserted into the gap. 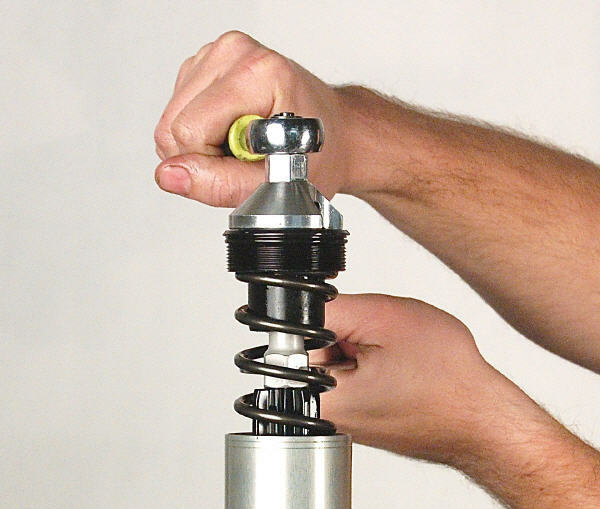 If the bushing is too stiff, gently use a screwdriver. D19- If you're not replacing seals, use blue masking tape (or equivalent) to cover the sharp edge of the bushing groove during removal. 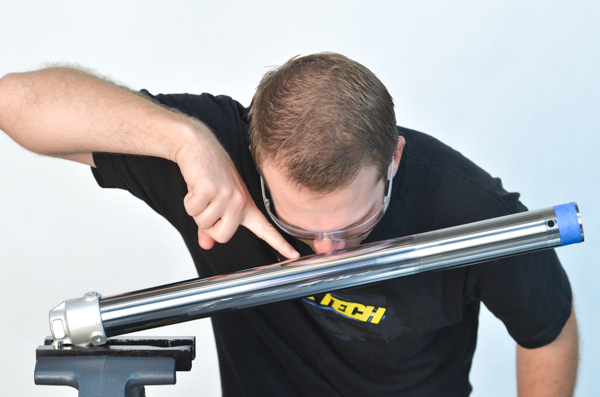 D20- Inspect the fork tube for pits, dings, and straightness. Come on AJ, take a closer look! D21- Inspect the bushings for damage, including worn Teflon or embedded material. If there is embedded material make sure you figure out where it came from so it doesn't happen again! 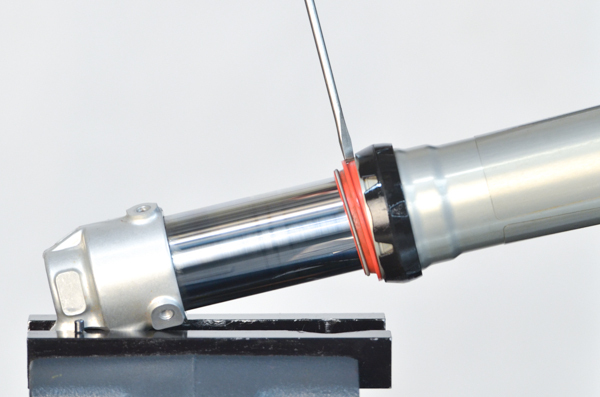 D22- Remove the adjuster rod from the center of the damping rods. D24- and remove it from the rebound rod. D25- To protect the seal pack the thread with heavy grease and push the damping rod out through the seal. Note - Seals are available at RT. 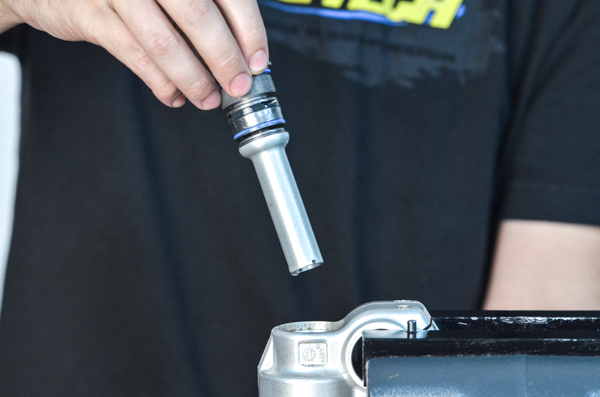 D26- When disassembling the forks, be sure to keep the Rebound and Compression sides separate. 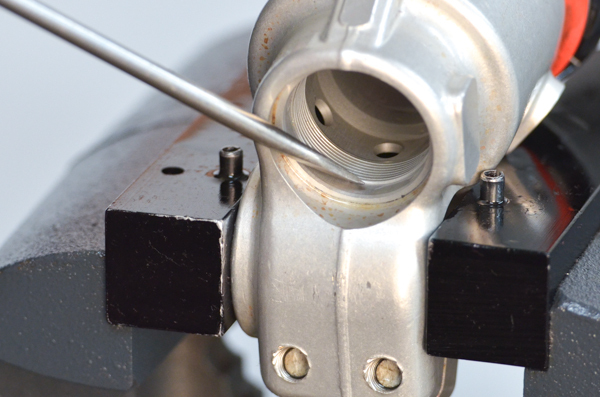 They are valved identically except for the direction of the Check Valve in the Bottom-out Needle. Tip - RRR: Red, Right, Rebound go together. 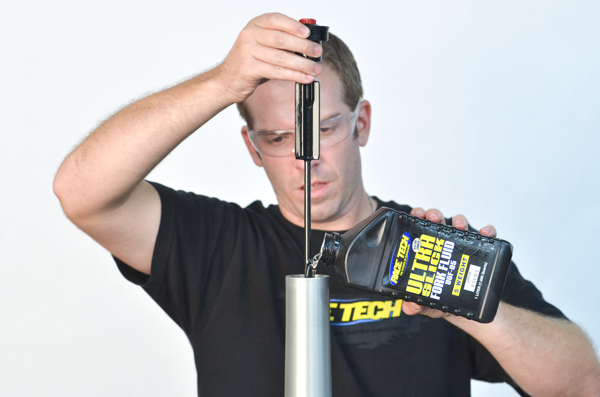 A1- Pack the damping rod thread with heavy grease to help protect the seal. 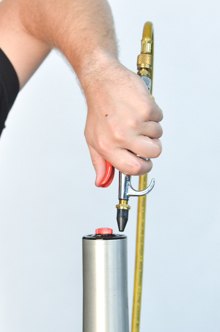 Install rebound rod into cartridge. A2- Install the spring seat onto the top of the cartridge. 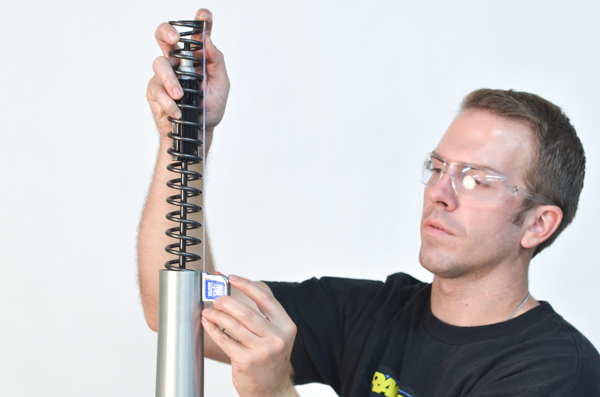 A3- Install the spring guide and jam nut assembly. 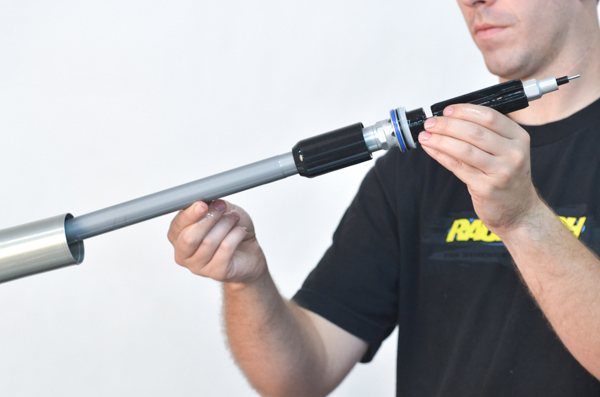 A4- Install the adjuster rod. 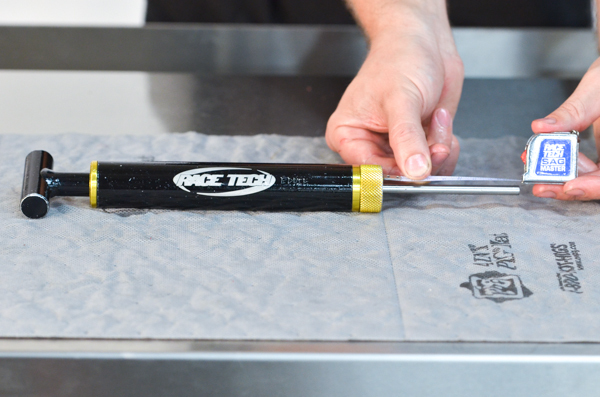 A5- Use the corner of a heavy gage plastic bag and place it on the end of the fork tube. 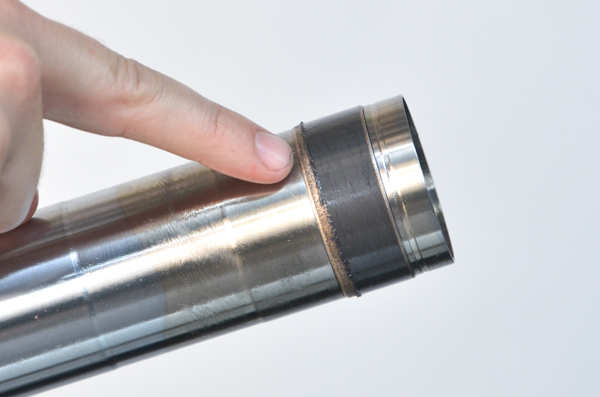 The will protect the seal from the sharp edges of the inner bushing groove on the fork tube. 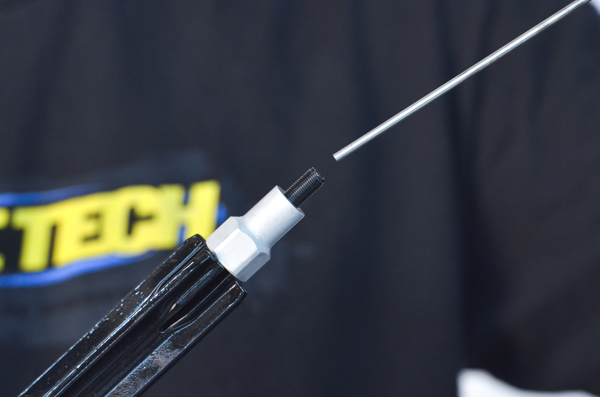 A6- Grease the sealing surface of the wiper with Ultra Slick Grease. 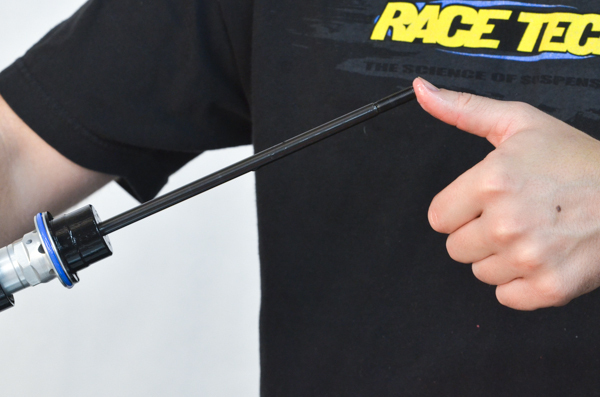 A7- Slide the wiper over the plastic bag (installation tool). Pull the bag taught to help the wiper have a smooth ride over the edge. 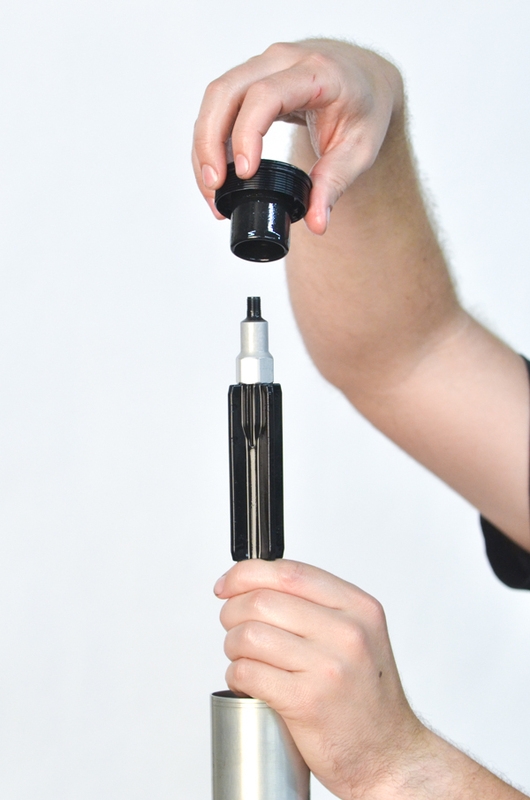 A8- Install the seal clip onto the tube. A9- Grease the ID of the seal. A10- Slide the seal over the plastic bag. Once again, keep it taught for easy installation. 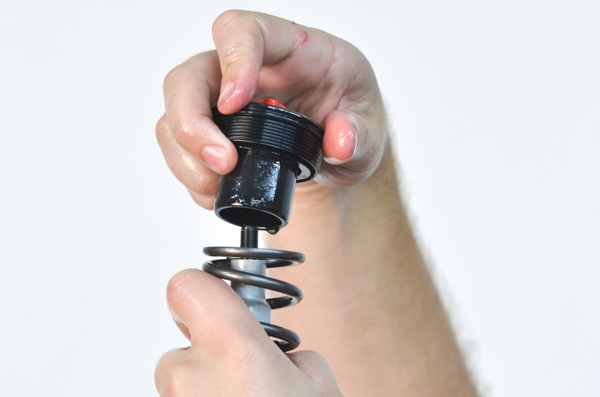 A11- Install the seal washer. 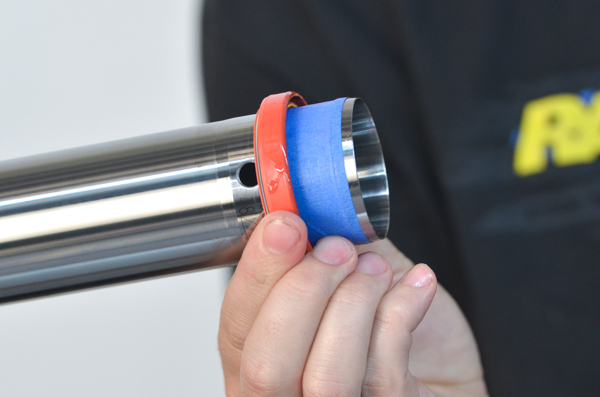 A12- Install the outer bushing. 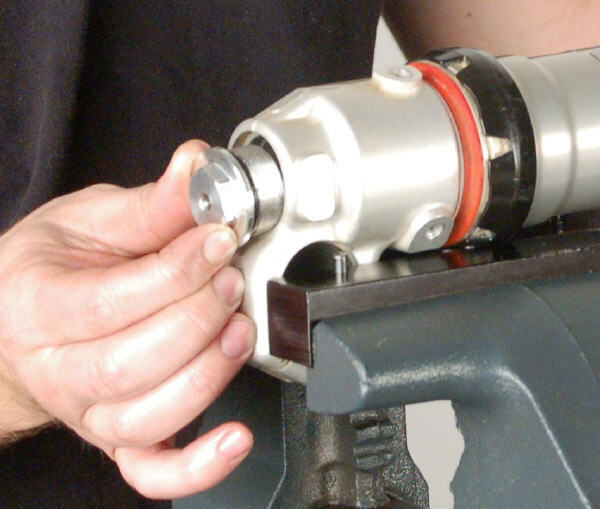 A13- Install the inner bushing into its groove. 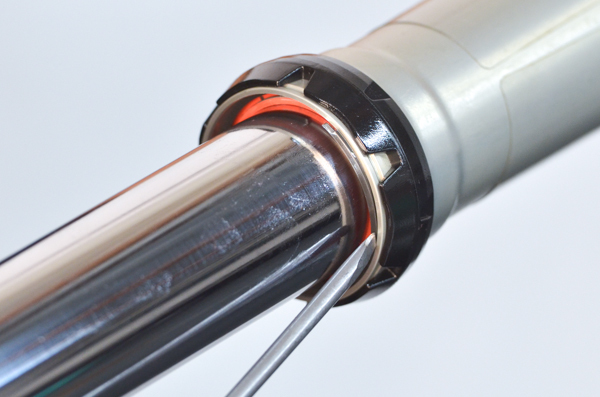 A14- Using a seal driver and fork tube, slide the fork tube into the firmly held seal driver and drive in the outer bushing with the washer. 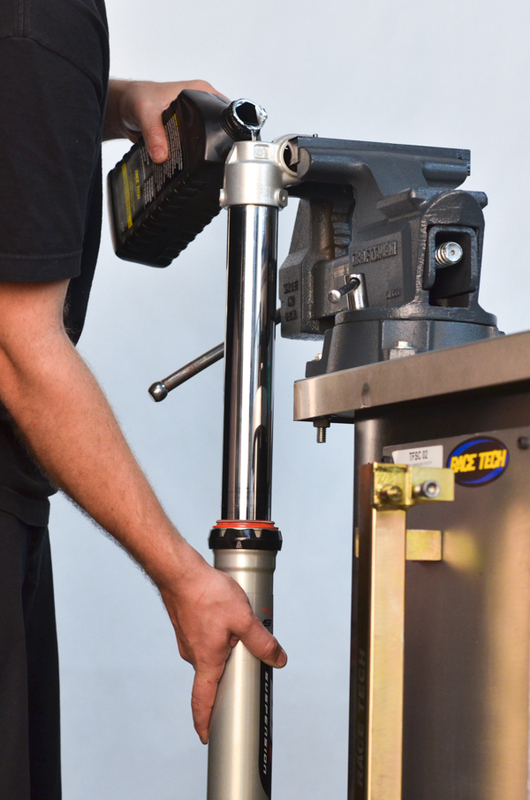 A15- Install the oil seal with the seal driver. A16- Install the clip. Make sure it is seated in the groove. A17- Install the dust seal. 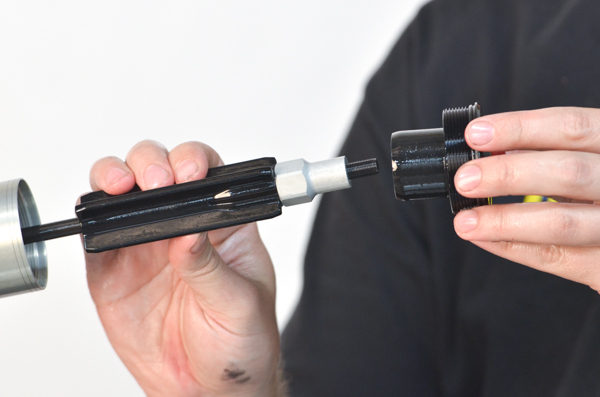 A18- Install the cartridge into the fork tube. 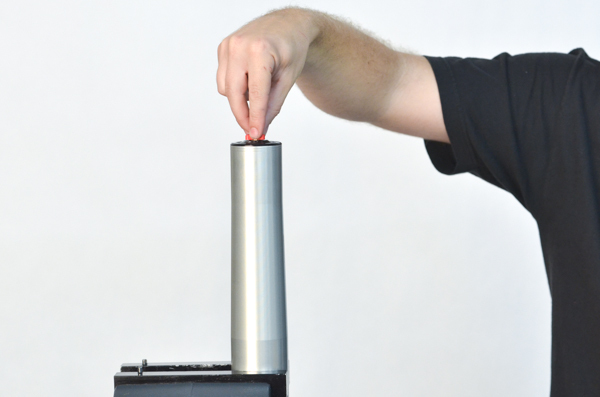 A19- Make sure the cartridge is fully bottomed out. 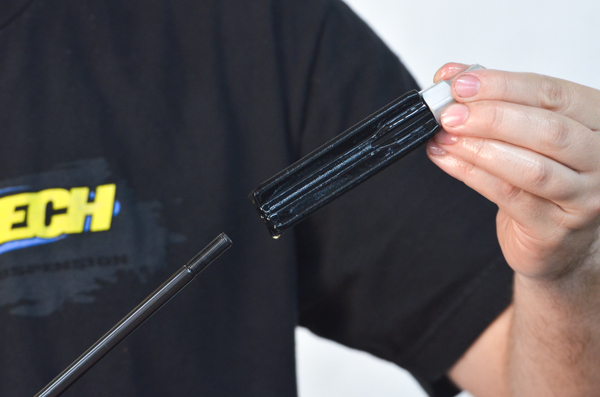 A20- If there is space between the cartridge and the fork bottom (shown in the photo) the cartridge is not full installed. 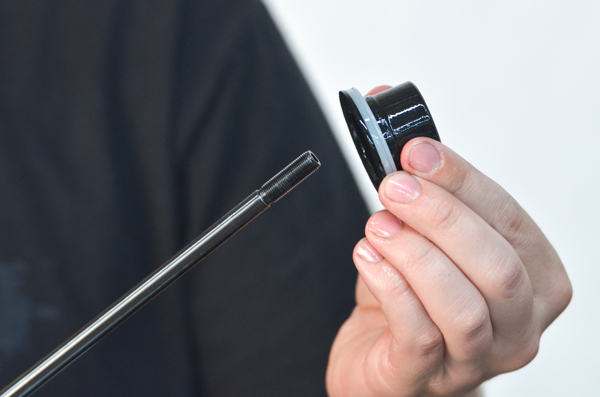 A21- Install the adjusting rod then temporarily install the cap onto the rebound rod. 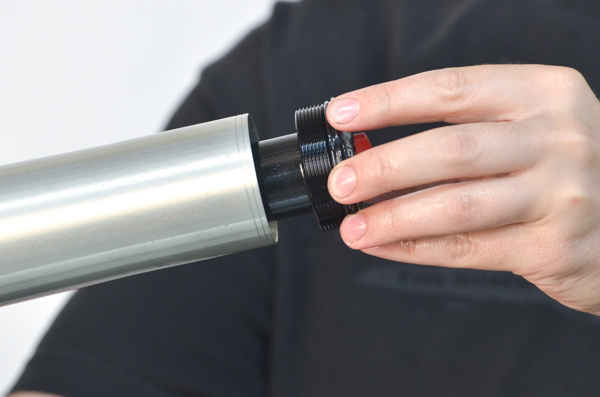 A22- Install the fork cap into the outer fork tube. 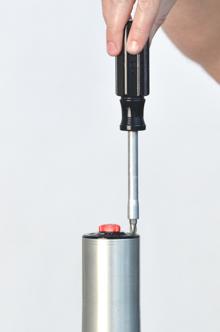 A23- Loosely tighten the fork cap. A24- Put the fork upside-down in a vice. Pour oil into the cartridge until it is full. 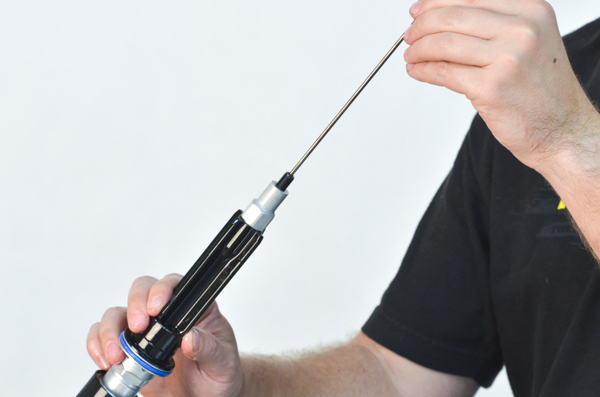 Bleed the cartridge by gently pumping the damping rod. 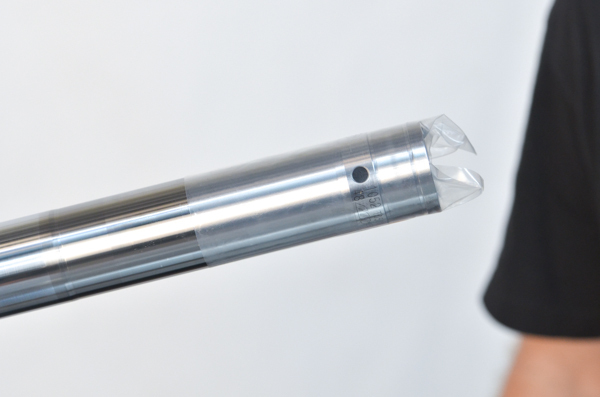 A25- Once the oil level gets above the large holes in the end of the cartridge it will start to fill the chamber on the outside of the cartridge. A26- Slightly compress and extend the outer fork tube while pouring in oil until the bubbles have stopped. 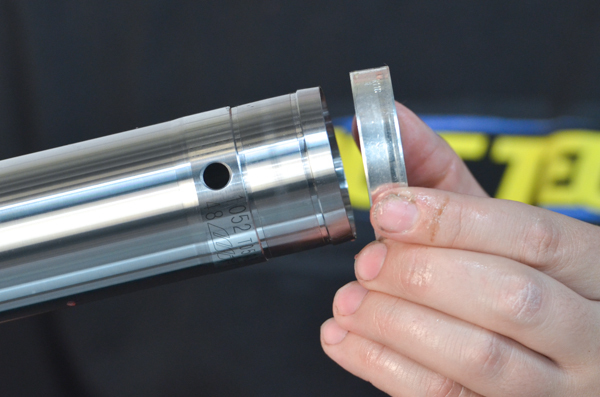 A27- Install the compression base assembly. Oil will overflow. A28- Tighten the compression base assembly. 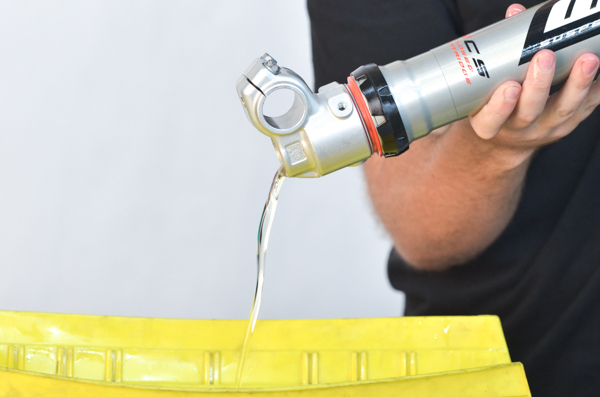 DO NOT USE AN IMPACT WRENCH! TIGHTEN BY HAND. A29- Continue to bleed the cartridge using the following method. Remove the bleed screw in the fork cap. A31- and slowly release pressure. Repeat this 4 times. 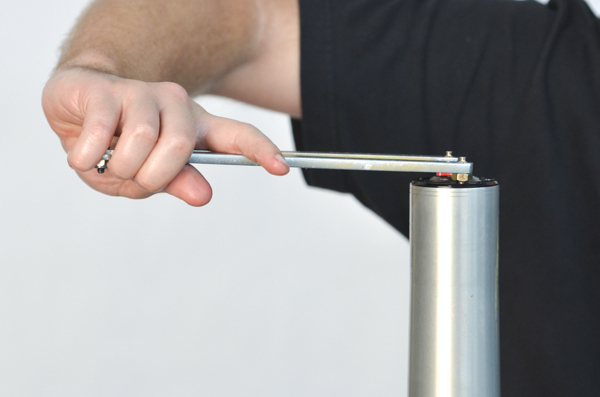 It will extend the fork enough so the notch in the end of the damping rod will get into the seal. This will bleed the remaining air out of the lower chamber. A32- Reinstall the bleeder screw. 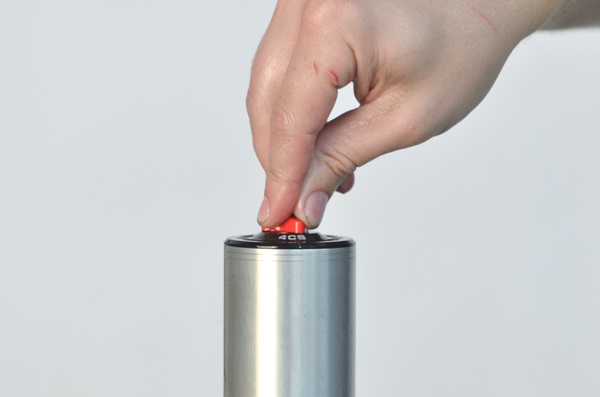 A34- remove the fork cap from the end of the damping rod. 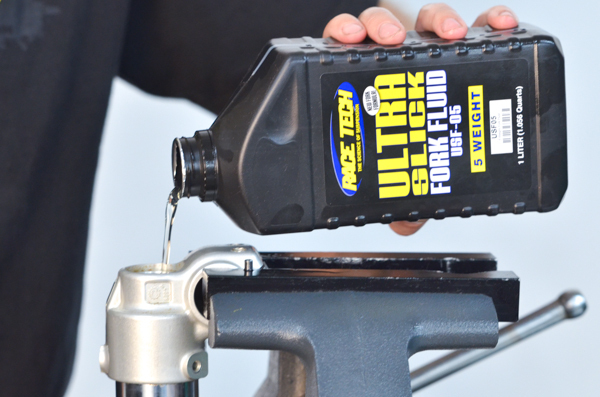 A35- Pour oil into the top chamber of the fork. A36- Set the tool (TFOL 02) to the correct oil level. 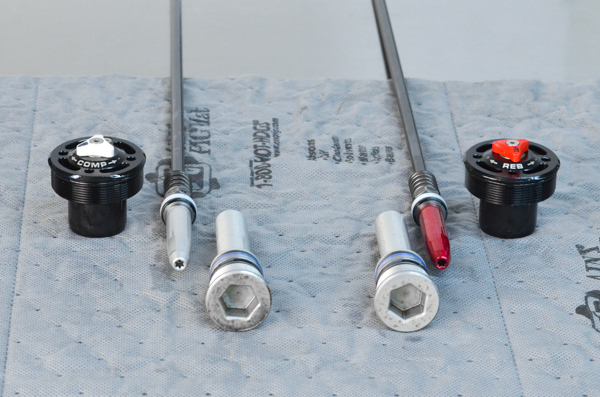 A37- With the Outer Fork Tube bottomed and the Damping Rod fully extended, set the oil level with the oil level tool. 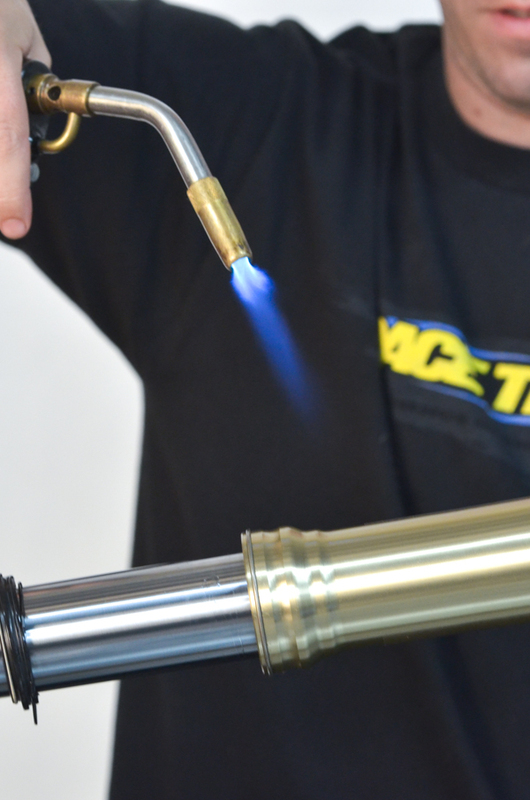 NOTE - You will need to extend the outer fork tube all the way before setting the oil level. 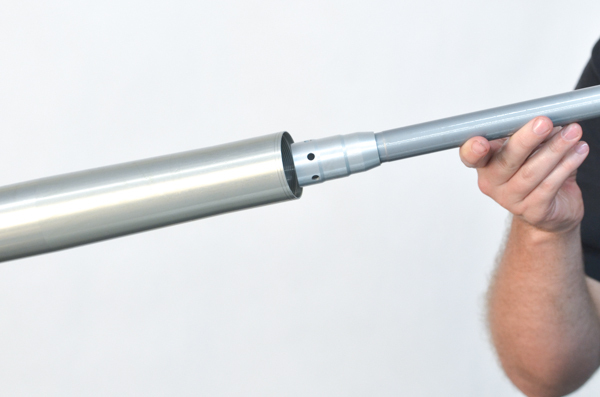 This is because there is a space between the inner and outer fork tube. To set the oil level correctly you must evacuate this area. Extending the fork tube all the way does this. 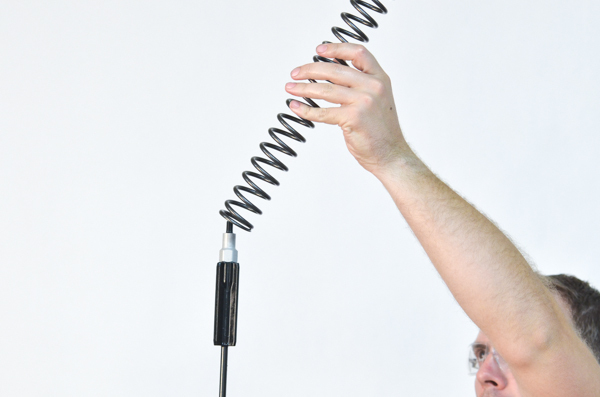 A38- Measure the Fork Spring Preload. 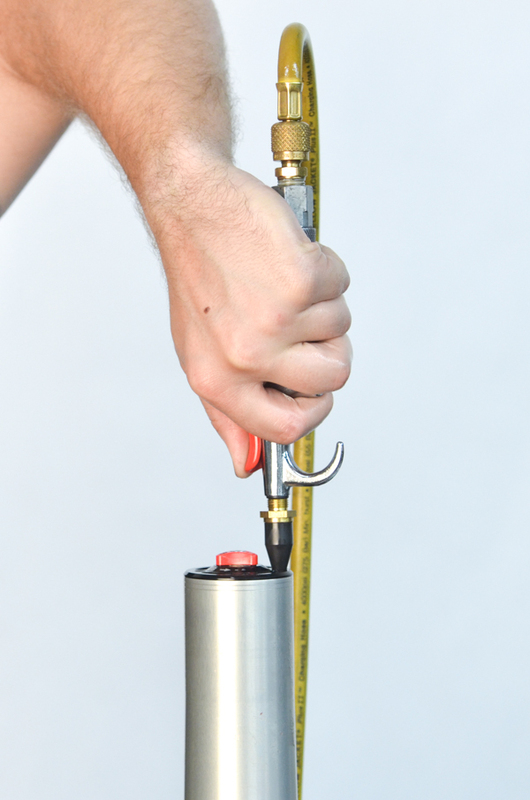 A39- Measure the Relaxed Reference Length. 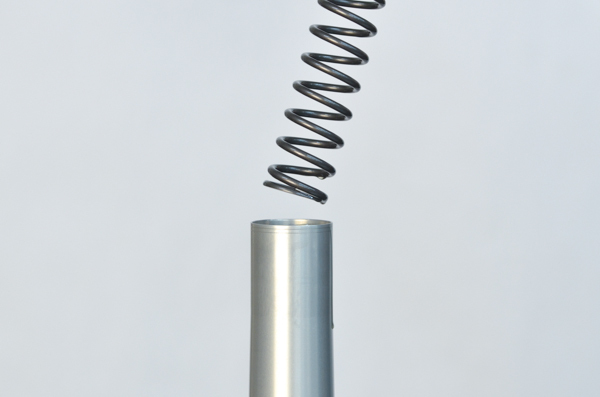 The Relaxed Length is measured between the top of the Spring and the top of the Outer Fork Tube (with the fork tube fully bottomed). A40- On 4CS fork caps the fork spring fits into a 7mm recess. This recess depth must be considered when calculating the preload. 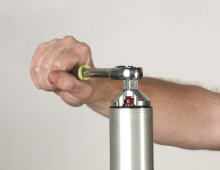 FA41- With the adjuster backed out all the way install the cap fully onto the rod. 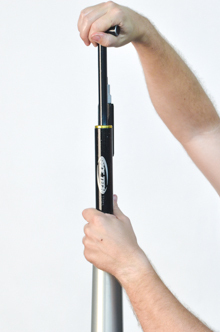 A42- Measure from the top of the Outer Fork Tube to the bottom edge of the Fork Cap. Add 7mm for the recess depth. This is the Set Length Reference. If the Set Length is less than the Relaxed Length there is postitve preload. The difference between the Relaxed Length and the Set Length is the preload. 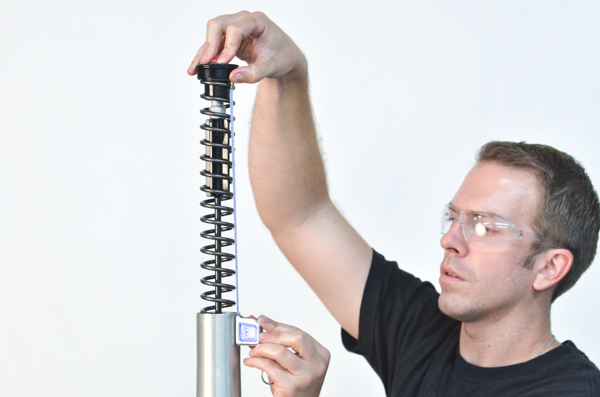 Adjust by adding or subtracting preload washers underneath the spring. This is usually 3-5mm. 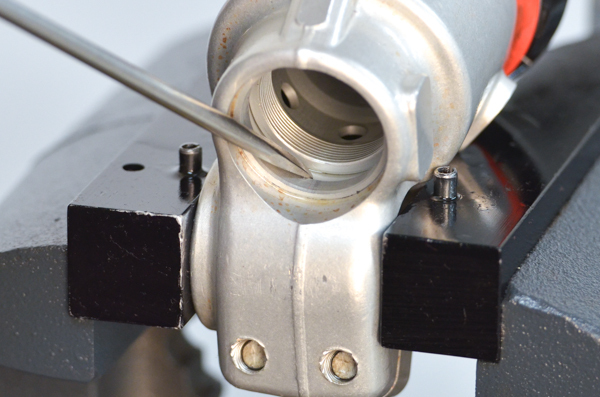 A43-Tighten the jam nut to the fork cap on the damping rod. 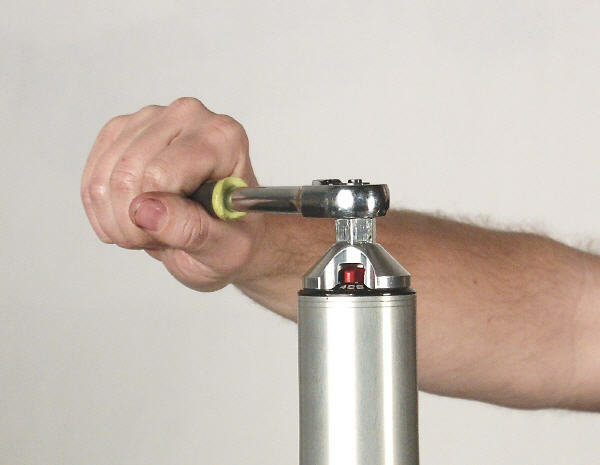 A44- Tighten the fork cap. A45- Set the compression and rebound adjusters to the recommended settings.